This week I saw a part of MM LKY that I only had fleeting glimpses of in the past. His persona and achievements are larger than life and it is so very easy for me to see him as Lee Kuan Yew and not a human being – a man of flesh, blood and emotions – just like me. I saw a few images of him this week that shook me to reality and made me realise that he is no different from me. In humanity, that is. I’m not for a moment suggesting that I’m as accomplished as he is – no, by no means! But what I saw was that he is just as human as I am. Some of the images I saw and read struck me to the core. For example, when he brought his hands to his lips and planted a kiss onto the forehead of his wife’s body lying in the casket – not once, but twice. Humanity. So often, he seemed and was portrayed as a harsh, hard man. And perhaps, he was at one point. We all were angry, idealistic young men at one point (I speak for the men). I know I was. I am much softer and reflective now than I was when I was younger. Then there was this picture of LKY’s grandson Yipeng with his hands on LKY’s shoulder. To see a grandson comfortable enough to do this, and in public, speaks a lot. Humanity. In his eulogy, he spoke about kissing his wife on the cheek when she was recovering from her stroke. I never visualised LKY as a man who would tenderly kiss anyone’s cheek, even his wife’s. Humanity. To be honest, I’m not so grieved by Madam Kwa Geok Choo’s passing as I am for Minister Mentor Lee Kuan Yew. We all have to go. As brutal as it may sound, it is the truth. I’m going, LKY is going, you’re going and his wife has left. It is what it is. LKY and his wife were clearly soul mates. And this is not mere platitude. Only the harshest of human beings could not see how much they meant to each other. In the Christian sense, they were “one flesh”. Part of that flesh has departed. How hard it must be for LKY, the man. Not the PM, not the SM, not the MM but LKY the man. Flesh and bones, just like me. The person whom he loved, who was a part of him, now is no longer in the flesh. It’s tough. So really, my sincere condolences. My observations over the past week have cast a new light on his achievements for me. Yes, at some points during the building of the nation, he seemed tough, uncompromising and even unfair. For a period, I even thought he did it out of ego. But now, seeing his humanity, I believe he did what he did out of the love for Singapore and Singaporeans. During the course of which, he may have offended some. This is natural for a man feisty and focused as he was. But I don’t question his motives. I think of a father bringing up a son to the best of his ability. A father will defend his son’s honour come hell or high water. Now, I believe LKY did what he did in the way he did because he loved the country and its people. In reality, up to this week, I never saw LKY as a person. I saw him as an icon, the Prime Minister, the architect of modern Singapore. This week, I saw him as a person – just like you and I. No difference. 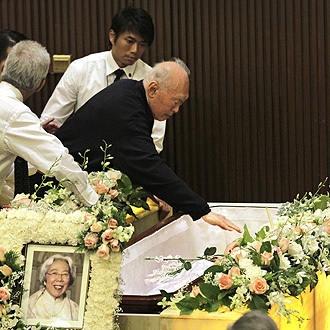 I feel privileged to have gotten a glimpse of another side of Lee Kuan Yew and his family. In their desire to be private, I never saw their humanity. Minister Mentor Lee Kuan Yew, my sincere gratitude and my heartfelt condolences. My condolences. I’m not aware of the details of your day-to-day personal life but one thing was apparent to me, and most likely the rest of the world – the mutual love, respect and devotion you and your wife had for each other. With the deep affection you had for each other, her passing must be tough. As you move on with what you must do, I pray to my God for strength, comfort and the peace to accept what is inevitable for all of us. I pray for comfort from your loved ones and friends and your continued vigour and focus on your work. The relationship your wife and yourself showed us is inspiring and endearing. Thank you for modelling that for us.